Craig and Yvonne Schaible were considering the purchase of a 111-year-old Victorian in Fanwood New Jersey. The owner had grown up in the house and was selling it following the death of her parents. However, an unsettling presence loomed over the house and threatened to fighten off buyers and decrease the value. The owner disclosed her experience with unexplained sounds and unsettling sights. 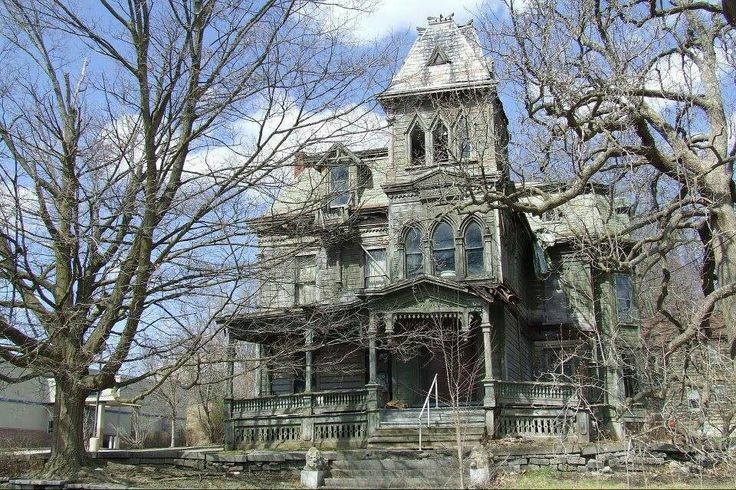 After the Schaible's heard some of the stories they decided to buy the 8 bedroom fixer-upper (built 1890) and paid the asking price. If you think ghost stories drive down the value of a house you might be correct - most of the time. But not always. The Schaibles weren't typical house buyers. They were living in a two bedroom town house and were on the hunt for a big old Victorian to restore. As soon as they stepped through the arching 8-foot high front doors they knew this house was the one. Furthermore, the couple is famous among their friends for elaborate Halloween parties every year. The ghost stories about the house "made it completely more valuable," Schaible says. Would I pay more money for a haunted house? No. The decision to buy the house was based on the house itself." But he did add that the spectral tales "Juiced it up the fact that the Halloween people bought a haunted house was so funny - too perfect." Six weeks passed from the time of the other until possession. During that time in the spring of 2001 the seller's husband stayed behind to ease the transfer of ownership. After a few beers one night, he told the Schaibles about apparitions he had seen and told them an eerie tale. One night he heard his wife calling him from the basement He went downstairs but there was no one there. Then he heard a disembodied voice chuckling in his ear. According to him and his wife the entity was picking on him. The Schaibles were skeptical - they didn't necessarily believe the stories. Everyone has their own perceptions. Then they moved in. The second night it became clear that something in the house wanted to make itself known. They were moving in and half-unpacked boxes were in disarray all around the house. A Civil War rifle was resting against a wall in a 12-foot wide hallway. In the middle of the night Schaible got up "and this very heavy rifle launched across the hall and landed at my feet." It flew about 8 feet. He searched but there were no loose floorboards or anything of that nature that could have caused the strange occurrence. So Schaible went downstairs into the kitchen and gave whatever it was a talking to. He said "Hey, I live here, I pay the mortgage, and I don't need this scaring me out of my mind in the middle of the night". Schaible reports that he ranted for about an hour. After that, the couple occasionally heard voices and caught glimpses of strange figures. But there were no more scares in the middle of the night. The sightings became less frequent as restoration progressed. The realtor who brought the house to the Schaible's attention reports that the presence of ghosts can add to or detract from a home's value. It all hinges on the buyer and what the house will be used for. Someone who wants to convert a large house into a bed-and-breakfast might use the ghost stories for marketing value (as long as they're not too scary). There was no history of violence in the home that the Schaible's bought which is good because murder or suicide definitely depresses value. Infamous deaths can make the house especially hard to sell. Consider Nicole Brown Simpson's town house or the house where 39 members of Heaven's Gate killed themselves to join a spaceship hiding behind the Comet Hale-Bopp. Nobody wants to live with the bad karma. These properties fall under the category of "stigmatized". Often a property is stigmatized because of an environmental or structural problem, but some are stigmatized because something horrible happened there. It took 2.5 years for Nicole Simpson's house to sell in a neighborhood where it would have normally sold within 3 months. The Heaven's Gate house was heavily stigmatized. Eventually the owner gave it back to the bank after failing to sell it. The ban sold it at a steep discount. The property has since been bulldozed for possible redevelopment it the future. Neighbors even changed the name of the street. So what about ghosts? If it ties to a real event, a place where there was a murder in the house, that's completely different than a ghost that's been there since the 1900s. If it's a fun story it will probably have little effect on the house. To this day people ask Schaible if he's scared. He says no, you have to live there to understand, the apparitions are fleeting "so fast that it's over before you know it." His dream is to grow old in the house - just as the previous owners had.